11052013_The_Rise_Of_Germanys_New_Right_0003: The Rise Of Germanys New Right: Made in Germany: Hermann Bredehorst - editorial and portrait photographer Berlin, Germany. 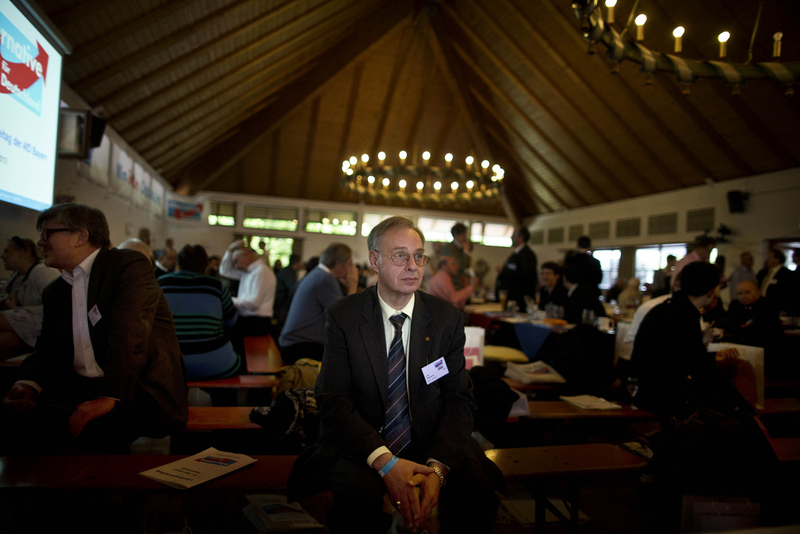 May 11, 2013 - Ingoldstadt, Germany: Delegates of Germany's anti-euro party AfD 'Alternative fuer Deutschland' (Alternative for Germany) attend the Bavarian state party meeting. The AfD party is a euro-skeptical, conservative party. Recent polls show that about a quarter of the German electorate may consider voting for a party that advocates a German exit from the eurozone. General elections in Germany are scheduled for Sept. 22. Yet AfD has failed to generate broader support, languishing in opinion polls at 3 to 5 percent besides a massive coverage in the countries conservative media.